Unfortunately the previous week became fully booked, very quickly. 30km/hr northerly breeze dry sunny and very cold, it had been the driest October in many a year. The planned walk, a visit to all the nire valley lakes, warm clothes thick hats, thick gloves and keep moving was the order of the day. 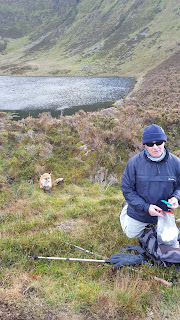 We left the nire carpark and were blown up the ridge to Coumfea lake and a little shelter from the biting wind. Then moving on to the Coumalocha lakes we stopped between the two lakes for a cold quick bit to eat in the November sunshine. 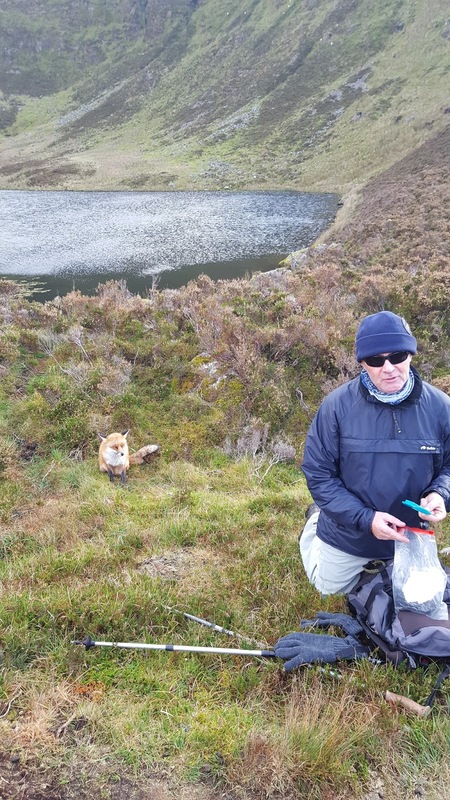 We climbed over the next ridge and dropped down into the lower sgilloge lake and were greeted and entertained by “sionnach rua”playing and posing for pictures like a model. 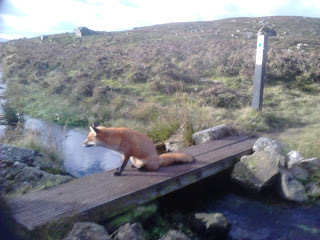 We then continue up to the next sgilloge and again our friend reappeared blocking our way across the little bridge until we paid a little fee. A sight which none of us had ever experience before and most likely never to forget for a long time, we then continued the walk back down to the nire car park. Another glorious day on the hills! Sunday 11th December. 14:00 outside the Park Hotel or 14:30 at the Curragh Ardmore. Our annual weekend away next year will be in the Leenaun Hotel. 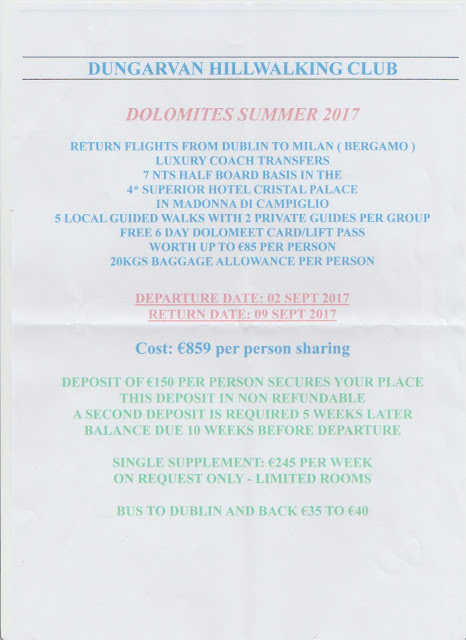 The proposed date is Friday May 12th / Saturday 13th at a cost of €110 per person for two nights B & B, one evening meal & 1 sandwich. One extra night is €35 (B&B) and one extra meal at €20. Single supplement is €12:500 per night. Names to Peter who is coordinating. 49 Members attended this years AGM where refreshments and a slide of our recent Austrian holiday were displayed. A light hearted awards ceremony also took place. · With regard to discussion at the AGM about the size of donation to be made from the Comeragh Crossing to a chosen charity, no EGM minutes can be located, and there are no specifics in the Club Constitution. Following further discussion by the Committee, the amount of donation will be decided by the Comeragh Crossing Committee depending on the profits made. Richard Dykes has agreed to be chairman of the crossing committee and is actively seeking a management team to put on a first class walking event on the 1st July 2017. All positions must be filled to facilitate the running of the event. The possibility of a “Topflight” walking holiday to Italy in September is being investigated, details will be made available when available.